I’m sticking with a beetle theme this week, it seems. My last post focused on the currently ubiquitous soldier beetle. This one spotlights the dogbane beetle. The iridescent green dogbane beetle is so named because both the larvae and adults feed primarily (maybe exclusively?) on dogbane and milkweed plants. The larvae feed on the roots and the adults feed on the leaves. Since both dogbane and milkweed plants have the same bitter tasting milky sap, it seems an odd choice of food, but quite a few other insects (including monarch caterpillars) share the same narrow diet, so there must be something good about it. Because of their relatively large size (about 1 cm in length) and their iridescent color, dogbane beetles are pretty easy to spot in prairies. For some reason, I usually seem to see and photograph them on plants other than dogbane or milkweed. Not sure what they’re doing on those other plants… Regardless, yesterday morning I saw a bunch on dogbane plants, where they belong, so I stopped to take some photos. They’re awfully cute, aren’t they? 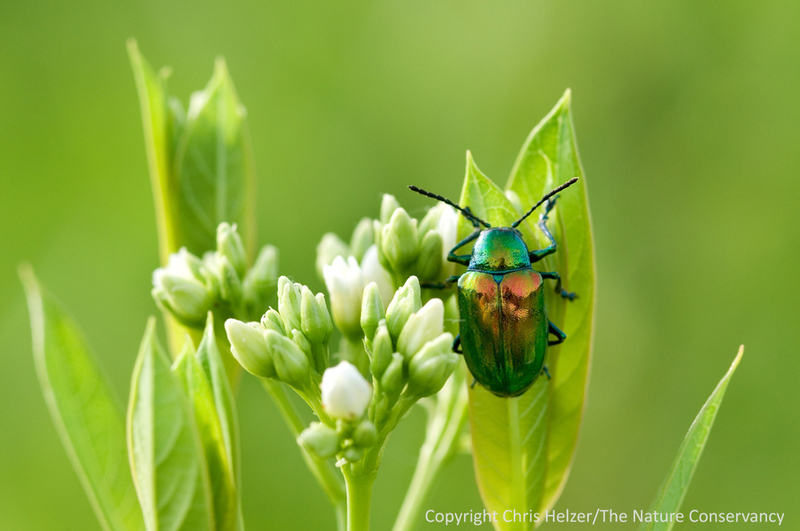 This entry was posted in Prairie Insects, Prairie Natural History, Prairie Photography and tagged apocynum, asclepias, dogbane, dogbane beetle, green, iridescent beetle, milkweed by Chris Helzer. Bookmark the permalink. 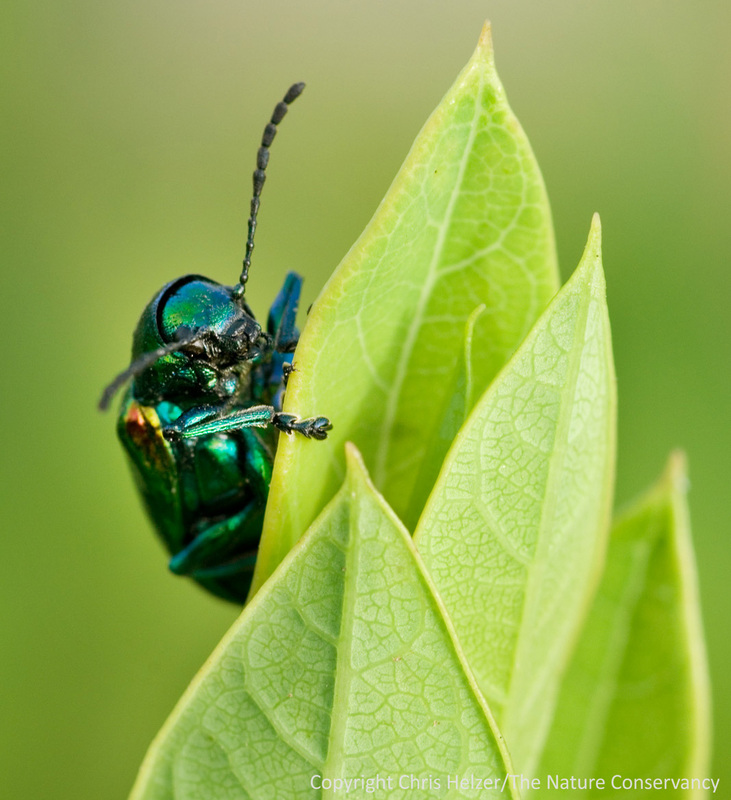 How do I differentiate dogbane with Japanese beetle? I know the latter prefers roses but not exclusively. Is the plant preference a clue? Thank you. I’m no expert, but I think Japanese beetles are bigger (1.5 cm compared to 1cm for dogbane beetles) have brown elytra (wing coverings) and white spots around their tail end. Other readers may have better characteristics to look for. I found one of these in my yard last year. They are really stiking in their appearance. The Japanese beetle is quite different in morphological features and even in details of coloring. See the two bugguide images here: http://bugguide.net/node/view/429113. The sap chemicals of milkweeds and dogbanes are not identical, and while some feed on both, quite a few insects prefer one or the other, or even appear to be exclusive to either milkweeds or dogbanes. I also meant to include — For example: I have never encountered this beetle on milkweeds, nor monarch caterpillars on dogbanes. Thanks for adding these points of info, James. I’ve not seen this beetle on milkweed either, but found a couple references (albeit online, non peer-reviewed) that mentioned it using milkweeds. They are small jewels in an already stunning beauty, our native prairies. They are not cute..they are stunningly…BREATHTAKENLY BEAUTIFUL!!! If feeding exclusively on dogbane/milkweed, as well as, being conspicuous herbivores it’s safe to assume they are sequestering defense chemicals from the plant and saying to the world, ‘don’t eat me, I taste bad.’ One of my undergraduate instructors is the expert on the chemical ecology of Danaus (Monarch’s), here’s a great link, http://homepages.wmich.edu/~malcolm/SM-information/Malcolm-Research.htm.